"Our aim was to determine whether we could create a wireless biological interface with cockroaches, which are robust and able to infiltrate small spaces," says Alper Bozkurt, an assistant professor of electrical engineering at NC State and co-author of a paper on the work. "Ultimately, we think this will allow us to create a mobile web of smart sensors that uses cockroaches to collect and transmit information, such as finding survivors in a building that's been destroyed by an earthquake. "Building small-scale robots that can perform in such uncertain, dynamic conditions is enormously difficult," Bozkurt says. "We decided to use biobotic cockroaches in place of robots, as designing robots at that scale is very challenging and cockroaches are experts at performing in such a hostile environment." But you can't just put sensors on a cockroach. Researchers needed to find a cost-effective and electrically safe way to control the roaches, to ensure the roaches operate within defined parameters – such as a disaster site – and to steer the roaches to specific areas of interest. 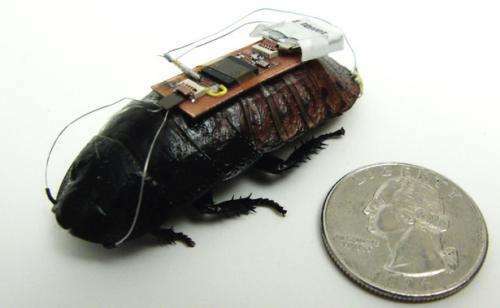 The new technique developed by Bozkurt's team works by embedding a low-cost, light-weight, commercially-available chip with a wireless receiver and transmitter onto each roach (they used Madagascar hissing cockroaches). Weighing 0.7 grams, the cockroach backpack also contains a microcontroller that monitors the interface between the implanted electrodes and the tissue to avoid potential neural damage. The microcontroller is wired to the roach's antennae and cerci. The cerci are sensory organs on the roach's abdomen, which are normally used to detect movement in the air that could indicate a predator is approaching – causing the roach to scurry away. But the researchers use the wires attached to the cerci to spur the roach into motion. The roach thinks something is sneaking up behind it and moves forward. 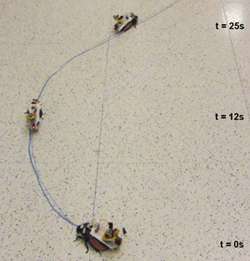 In a recent experiment, the researchers were able to use the microcontroller to precisely steer the roaches along a line that curves in different directions. More information: The paper, "Line Following Terrestrial Insect Biobots," was presented Aug. 28 at the 34th Annual International Conference of the IEEE Engineering in Medicine & Biology Society in San Diego, Calif. The paper was authored by Tahmid Latif, a Ph.D. student at NC State, and co-authored by Bozkurt. Bozkurt has previously developed similar interfaces to steer moths, using implanted electronic backpacks. riiight... they are going to use this technology to search for earthquake survivors. true and ironic as cockroaches can survive holocaust, bit useless though if there is an emp from nuclear derived seismic shock, hundreds of them wandering around carrying burned out baggage ! Soon, the cockroaches will be controlling us remotely. Just make sure you train the roach to hit reverse fast when someone takes off one of their shoes. The guys at BackYardBrains have been doing this for years. How is this any different? Or is this the same group?? Not even a single notion of morality issues. I find this disturbing. I know, we are talking just about cockroaches and many would squeeze them on sight. But still. How many arches of development is needed before someone could replace the bugs with humans? I would like to see at least a rudimentary morality framework carried out along with technical research and informed every time there are news about research projects like these. In wrong hands, this kind of technology could become the ultimate device for human slavery. Dhanne, humans are a little to complicated to be controlled with electrodes efficiently (at least in a "humane" way). Thankfully to control humans relatively well we just need the psychological methods.